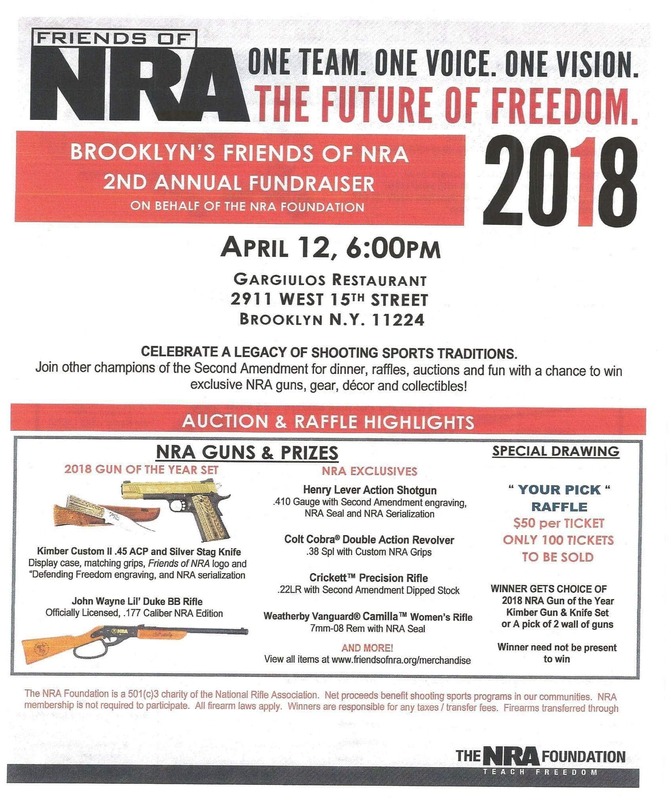 SOUTHERN BROOKLYN – The Brooklyn Friends of the NRA is planning to hold a fundraiser at Coney Island’s noted Gargiulo’s restaurant on April 12th. According to their website, this organization will hold its second annual fundraiser to raise money on behalf of the controversial NRA. It will include guns being raffled off, as well as décor, gear and other collectibles. Up to $1,500 per ticket is being offered. This has been met with swift reaction from other local politicians, considering Coney Island’s problems with gun violence. “At a time when our country is mourning the loss of 17 lives in a mass shooting, it is profoundly disappointing that a storied Coney Island institution, with a long history of being a strong civic and community partner, is choosing to host a National Rifle Association fundraising event that includes raffle giveaways of guns. Bringing an event like this to Coney Island is an affront to all of the hard work that our community has done to address gun violence in our neighborhood. We know that Gargiulo’s has always had the best interests of the Coney Island community at heart, which is why it is so disappointing that they are hosting the NRA, an organization that actively lobbies for concealed carry reciprocity, something that NYPD Commissioner O’Neill has rightfully called ‘insanity.’ There is no room in Coney Island or our city for events like this. Ross Barkan, a Democratic candidate for Senator Golden’s seat, is calling for supporters to call Gargiulo’s and demand the “disgusting event” be cancelled. Barkan’s opponent, and anotehr contender for Golden’s seat Andrew Gournades, sent out a tweet saying the fundraiser was “unacceptable”. When Garguilo’s was contacted in regards to this event, no one was available to comment. When Golden’s communications director was contacted, he had left for the day. Even Vincent Sallustro, the contact person of this fundraiser, was unable to be reached with phone calls going to his voicemail. A peaceful assembly of law abiding citizens at a private venue advocating for an inalienable constitutional right should not warrant any type of call to cancel the event. The firearms that are being raffled at this event are NY STATE ACT compliant and are only going to those individuals who are legally allowed to own a firearm in the City of New York. Any elected official calling on canceling this event is an abuse of power. agreed. The elected officials have no right to dictate what the owners can do in their own establishment. Law abiding citizens are not the problem. Best pay attention here before calling for restrictions on our right to peaceably assemble.